Now Available via Limited Edition eBook: Make: Getting Started with Circuit Playground Express @adafruit @humble @makermedia « Adafruit Industries – Makers, hackers, artists, designers and engineers! Make: Getting Started with Circuit Playground Express is written by Mike Barela, author of GSW Adafruit Trinket (also in the bundle). Mike is an engineer & Maker and recently joined the Adafruit team. 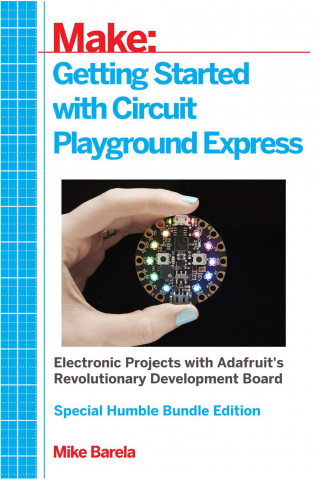 Humble Bundle purchasers will be the first to have the book to help them learn about Circuit Playground Express, Adafruit’s popular and revolutionary learning board. After the Humble Bundle, this book will be going back into the vault until arriving at the printing press later this year. Adafruit will have all sorts of bundles and specials tied into this new publication – stay tuned later this year. Getting Started with Circuit Playground Express will be out in paper and ebook forms around the time of World Maker Faire in NYC (September). Excited about this book or Circuit Playground Express? Let us know in the comments!